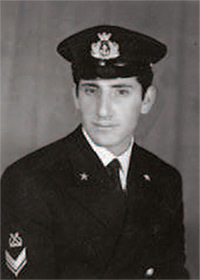 Born in Florence, Amerigo studied at the University of Pisa, before becoming secretary to his uncle who was Florentine ambassador to Paris. From 1480 he become an agent of the Megici family of Florentine bankers. In 1491 they sent him to Serville in Spain to look after their shipping interests there. Thus, he was there when Christopher Columbus sailed upon, and returned from, his first voyage of discovery. Attracted more by the prospect of going to sea than merely supplying provisions to the ship, he partook in two expeditions to the New World in 1497 and 1499. The second of these discovered Brazil and the mouth of the Amazon river. 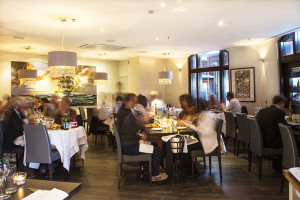 Amerigo Vespucci is one of the longest established independent restaurants on the Wharf, celebrating 20 Years serving Italian Cuisine as only true Italians do. The restaurant and bar have outside terraces which are great places to relax with friends or colleagues. Our restaurant has a fantastic view of the Docks from Monday to Friday we are open from noon until 11pm serving Lunch and Dinner and drinks inside or Alfresco, Weekends we are only open for dinner on Saturdays from 6pm until 11pm, it also benefit of private area which can be reserved and can accommodate 30 people for either drinks or dinner an ideal venue for that private occasions. Daily specials offer a selection of regional flavours from the four corners of Italy and not forgetting the Islands that surround. Amerigo’s a la carte menu captures authentic flavours using produce from all over Italy, simply blended and prepared, Fresh pasta, vibrant salads and fresh fish all are in abundant on the menu. Why not come and try one of our signature dish, GAMBERONI ALL’ AGLIO, Fresh king prawns, seared with olive oil, garlic seasoned with chopped parsley and flamed with white wine a great appetizer. Our wine list has a wide selection of Champagne and Prosecco ranging from all regions of France and Italy, from Baby Tuscans to bold Amarone’s to punchy Chianti’s we also have a selection of New world wines, something for every one! On your arrival you can enjoy from our bar a selection of classic cocktails such as Mojito, Cosmopolitan or a Bellini we also have one of the largest selection of Italian Grappa and digestivo’s. Your dining experience at Amerigo Vespucci will be recognised above other Italian restaurants on The Wharf , Capture the Italian spirit with our decor and cuisine surpassing all your expectations. The alfresco bar will be an ideal venue for private functions from corporate occasions to simply drinking with friends. Amerigo’s will have two large screens available to view all the sporting action, our bar area will be offering a large selection of Prosecco based cocktails carefully blended by our bar staff, we have introduced a “spuntini” menu which offers a large selection of finger food ideal for a quick lunch or a gathering after work with friends traditional Italian nibbles such as crisp calamari’s to Parma hams marinated olive and spicy Italian sausages. 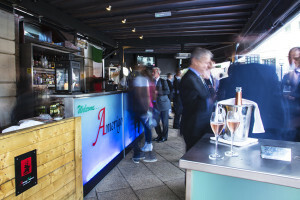 Our outside Alfresco Bar makes Amerigo a great new venue to visit alongside nibbles and drinks you can’t go wrong with an authentic Italian pint of ice cool Peroni. Now opening all day from 9am for good Italian coffees and Italian pastries freshly squeezed Sicilian blood orange juice, traditional lemon ice and brioche, to toasted crostinis. In the heart of the Summer months wind down in our chilled out Alfresco Bar where you know your dining needs will be in good hands no matter if its light quick lunches or afternoon snacks we give our customers that true Italian factor. Whether its Wimbledon or a major football game we’ll be sure to keep you entertained at our outside Alfresco Bar with our exquisite outdoor Italian dining! 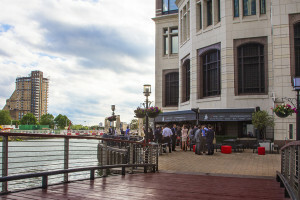 Overall, Amerigo Vespucci’s restaurant on The Wharf and our new outside Alfresco Bar promises to be a fusion of comfort, culture, and convenience. In Italy we have an old saying, “at the table with good friends and family you do not become old”. We would like to invite you to stay young with us at our newly designed outside Alfresco Bar. Amerigo is located in the Canary Wharf district right opposite the Henry Addington pub. So avoid the crowds and visit our heated outside Alfresco Bar for all that is Italian! Finally we have available free car park tokens for parking at the weekend which we are able to give to customers using our restaurant or bar. We look forward in welcoming you soon. For reservations and all enquiries please call 0207 513 0288.